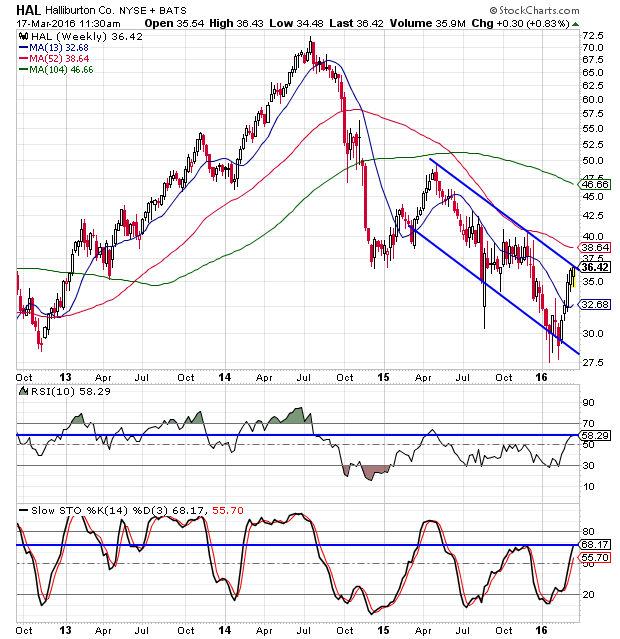 How Long Will Halliburton Stock Rally Last? In just over a month, the price of oil has rallied almost 50%. This rally has caused a number of oil and oil services companies to rally as well. One such company is Halliburton (NYSE: HAL), the oil equipment and services company. From the low on Feb. 11, the stock has rallied over 30%. While Halliburton stock has rallied nicely, from my perspective Halliburton is getting ready to hit resistance. 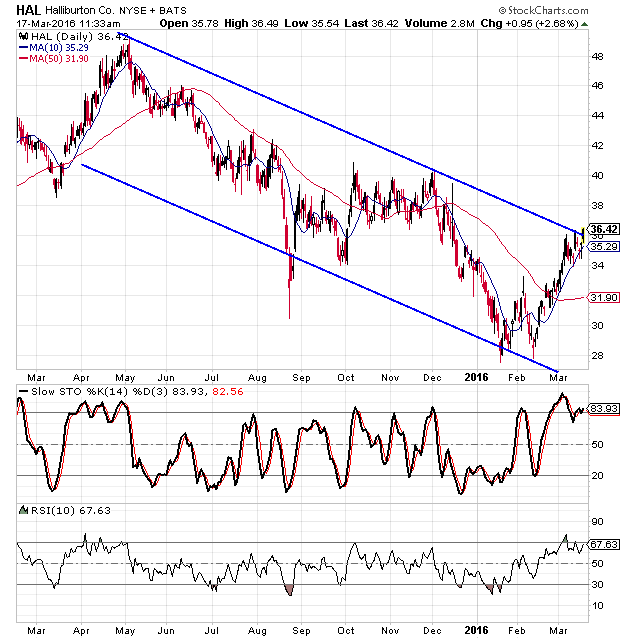 On the daily chart we see that Halliburton stock has been in a downward sloped trend channel going back to last May and the stock is now hitting the upper rail. We also see that the 10-day RSI has been bouncing around the 70 level for a couple of weeks now and the daily stochastic readings have been in overbought territory for the better part of a month now. The weekly chart shows a similar pattern as the daily chart. We see the trend channel coming in to play and the oscillators aren’t in overbought territory, but they are approaching the highest levels they have reached since last April. We also see how sharp the fall in Halliburton stock was in the second half of 2014 and how that decline continued int0 2015. Now the stock faces resistance from the upper rail of the channel, its 52-week moving average and eventually the 104-week will come in to play. Another thing that makes me think the stock’s rally is about to come to an end is the sentiment toward the stock. Despite the fact that the stock lost over 60% of its value from the 2014 high to the recent low, the sentiment toward Halliburton stock is still bullish. The short interest ratio is only 2.42 and the analyst ratings show 28 “buy” ratings, seven “hold” ratings and only one “sell” rating. I would understand if we saw this much optimism toward a stock that was up 60% in the last year and a half. But Halliburton is still down approximately 50% from its high and that is after rallying 30% in just over a month. I don’t think the rally in Halliburton can continue and I would look to short the stock in the $35 to $38 range. In addition to the resistance from the upper rail of the channel, there is also some resistance in the $40 area and then there is the 52-week moving average. The stock hasn’t been above the 52-week moving average since October 2014 and I don’t see it moving above it while the sentiment toward the stock is so optimistic. As for a target, I can see the stock dropping back down to the $27.50 level on its next downswing. Should the stock move above $40, I would use that as a stop-loss point. It’s as close to perfect as anything you’ll find in this world. It’s the ultimate trading system—one handing you double-digit returns in just seven days. In and out. Just like that. It’s the fastest, easiest money you’ll ever see. Find out how right here.